Geneva – IOM, the UN Migration Agency, reports that 112,018 migrants and refugees entered Europe by sea in 2017 through 23 July, with almost 85 per cent arriving in Italy and the remainder divided between Greece, Cyprus and Spain. This compares with 250,586 arrivals across the region through 23 July 2016. Dimitrios Tsagalas of IOM Cyprus reported on Monday (24 July) that a boat with 143 migrants was found off Pomos Island over the weekend. The migrants arrived at Cyprus’s Latchi harbour early on Monday morning. Late Monday, Ana Dodevska of IOM Spain wrote Salvamento Maritimo, the Spanish government's sea rescue arm, has reported the 23 July rescue of 44 men, three women and one minor from two small boats located in the Sea of Alboran. The migrants were said to be from Morocco and various nations of sub-Saharan Africa. Their arrival brings total sea rescues off Spain in 2017 to 7,774, Dodevska said. IOM Athens' Kelly Namia reported today (25 July) that Greek authorities late last week (21 July) discovered the remains of a 7-year-old Kurdish boy near the Skaramangas refugee hosting site, west of Athens. The boy’s disappearance prompted an amber alert issued by the NGO 'Smile of the Child', and mobilized a police search operation, which led to the discovery of the boy’s body in the sea not far from the camp. Police say the boy appears to have drowned. The refugee child's parents have been placed under arrest for exposing a minor to danger. Based on their accounts, the child had originally gone missing in the early hours (1AM) Friday, when his parents and other refugees in the camp began a search without result. A search was launched and the child's body was eventually found in the sea. There were no obvious signs of injury or other indications of criminal activity, Namia writes. IOM Rome reports 9,396 sea arrivals to Italy this month through 23 July. That figure trails the full July totals for each of the past two summers by about 14,000 (see chart below), highlighting a trend that IOM has observed of slower traffic to Italy during mid-summer, and fewer deaths (approximately half of those recorded in July 2015 and 2016). 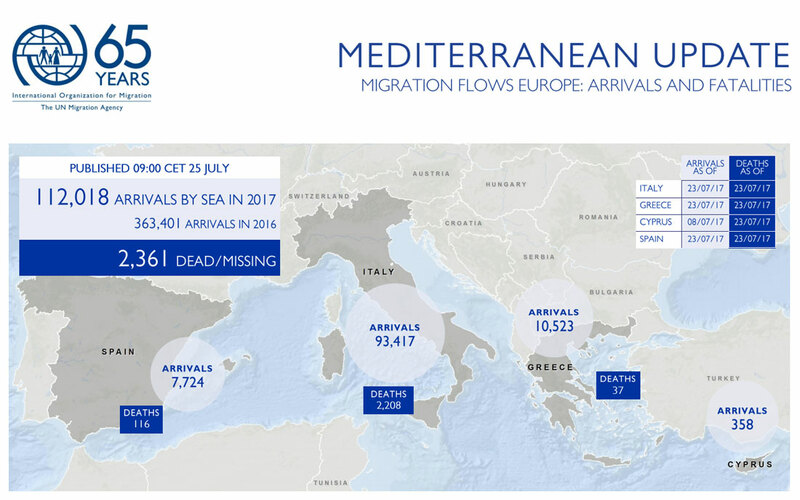 Nonetheless, for the year to date, arrivals to Italy remain slightly ahead of either 2015 or 2016 totals at 93,417. IOM Libya’s Christine Petré reported yesterday from Tunis that through 24 July, a total of 11,403 migrants have been rescued in Libyan waters while the remains of 349 men, women and children have been discovered along Libyan shores (see chart below). “Today (23 July), 281 migrants were rescued at sea off Tripoli and Azzawya by the Libyan Coast Guard. Early this morning, 133 migrants (120 men and 13 women) were rescued off Azzawya and a few hours later, 148 migrants (142 men, two women and four children) were rescued off Tripoli,” she wrote. The latest fatality in the region was reported last Friday (21 July), bringing the Mediterranean total to 2,361. Although this figure trails the number of deaths (3,047) recorded at this time last year, it nonetheless marks the fourth consecutive year migrant deaths on the Mediterranean Sea have exceeded 2,350. Worldwide, the IOM Missing Migrants Project (MMP) reports that there have been 3,282 fatalities in 2017 through 23 July (see chart below) with the Mediterranean region accounting for the largest proportion of deaths – almost three quarters of the global total. Among the newly confirmed fatalities from MMP are: one body found near Sabratha, Libya; remains of a lone migrant found at a ranch near Falfurrias, Texas, USA; a drowning in Río Bravo, Nuevo Laredo, Tamaulipas, Mexico; and nine deaths reported from the discovery in Texas of migrants trapped in a locked truck in a shopping mall parking lot incident (eight migrants were found dead inside the truck; one migrant rescued was later reported deceased at a local hospital).